Combining CRM with business intelligence and mobile tools is truly the next evolution in sales and marketing technology. Giving your executives and your sales teams data access allows them to make faster, better decisions and out-compete the other distributors in your markets.  Sales Management Plus is a leading CRM and business intelligence application designed for wholesale distributors. SMP is a “cloud-based” application that integrates with your ERP application to leverage important information such as accounts, contacts, and historical transaction data. Combining CRM with business intelligence and mobile tools is truly the next evolution in distribution technology, giving your executives and your sales teams data access allows them to make faster, better decisions and out-compete the other distributors in your markets. SMP is a leading CRM and business intelligence application designed specifically for wholesale distributors. SMP integrates with your ERP application to leverage important information such as accounts, contacts, and transactional data. 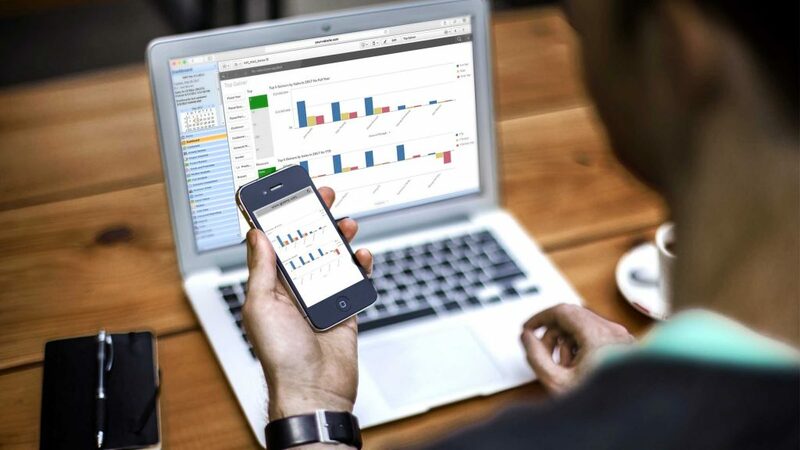 SMP includes native mobile applications along with dashboards to provide important analytical data to help management understand and direct their sales staff. Your business is unique, but most CRM solutions don’t understand distribution. Even worse, some software companies try to make a CRM that was designed for manufacturing or construction and force it to fit a distribution company. 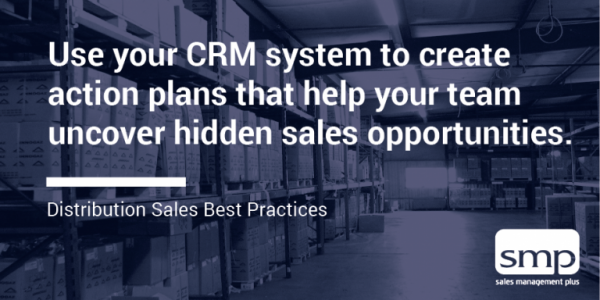 Many distributors have given up on CRM because of the endless customizations and frustrations from these “one-size-fits-all” solutions. Thankfully, distributors have SMP – a CRM solution designed specifically for the way distribution sales teams work. SMP provides you with one place to manage all of your important contacts — customers, prospects, vendors and more. By entering and maintaining all of your contacts in one centralized database, everyone on your team will have the information they need to track important activities, tasks, notes, emails, and more. With SMP, you have complete visibility to your important customer information including open orders, bids and quotes, sales and activity history and much more. You will be able to leverage your customer information for more than simply tracking contacts and activities. It also helps you identify who the key decision makers and influencers are in each account, track pain and hot-button issues, transfer important information to new sales reps and create customer report cards based on important buying behavior. SMP allows you to stay on top of your prospects and provides visibility into your sales activities. Your reps can manage their tasks, calls, appointments, sales notes, history and to-dos inside of SMP. Quickly report on activity levels to know that they are continuing to work their sales plans. 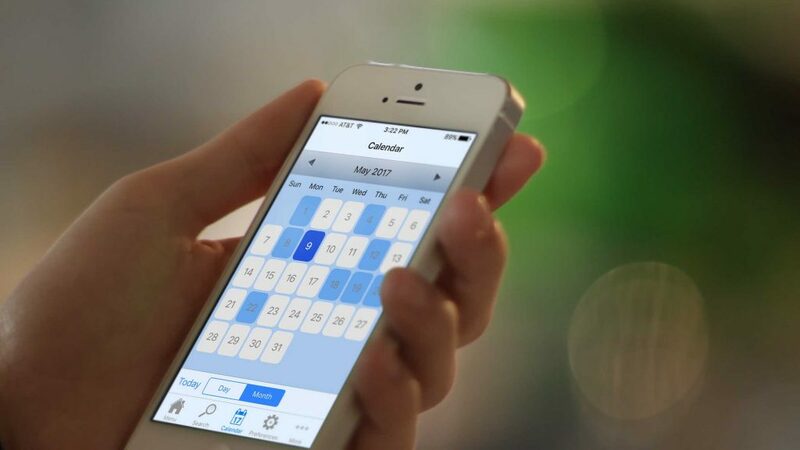 Activity tracking allows you to add tasks, log phone calls, record customer meetings and log information requests for yourself or for others in your company. You can easily review the activities for each customer and associate those activities with the responsible contacts in each company. Managers can easily report on and view activities to quickly understand activity levels and status. Sales opportunities are the life of any distribution company. SMP allows you to track, report on and prioritize your sales opportunities. Everything your reps and sales managers need to track opportunities is included — products, dollars and cents, activities, contacts and notes. SMP provides you with an aggregated list of all of your sales opportunities so that you can see what’s important in your sales pipeline, forecast revenue, collaborate with your team to solve sales issues and more. By using SMP’s built-in reporting and dashboard tools, you can know instantly where your sales forecast stands. 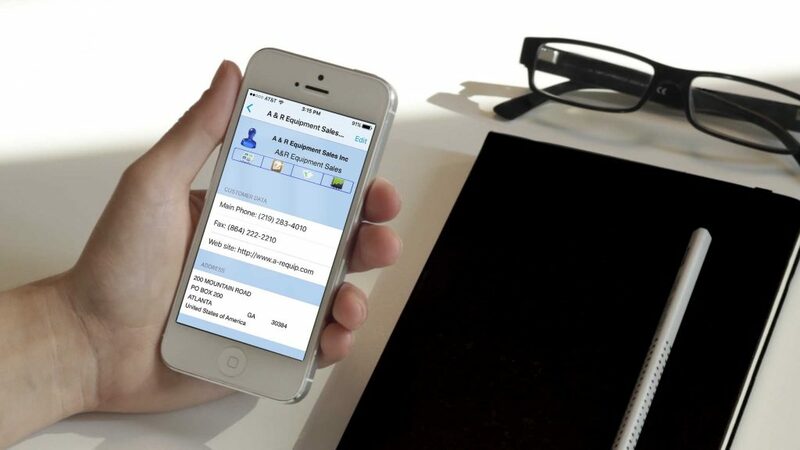 SMP Mobile allows your team to take their CRM data and all its customer intelligence with them everywhere they go. 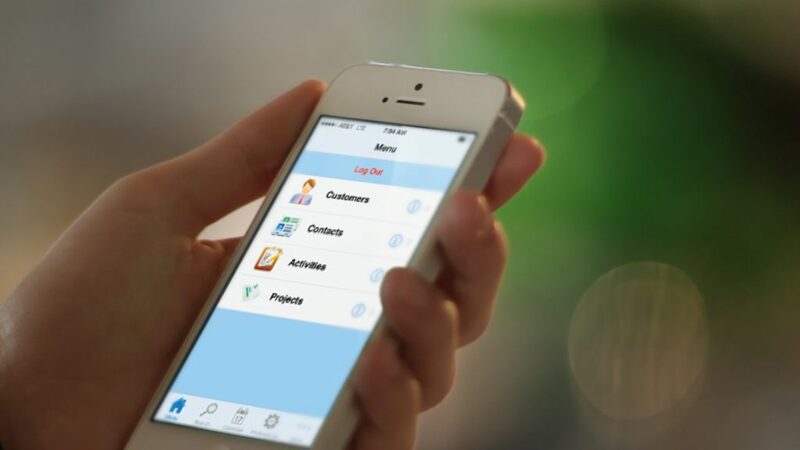 Customers, contacts, activities, scheduled meetings, notes, sales history and more—all combined into native applications for your for iOS and Android. 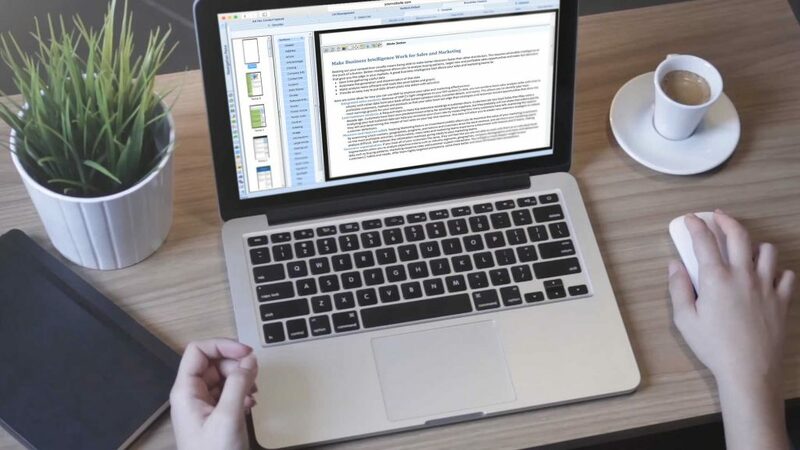 Designed specifically for the mobile user, SMP Mobile provides all the flexibility users typically enjoy in the full version of SMP from their desktop or laptop computer, but allows them to take it on the road. Combining CRM and ERP data, analytics, data visualization and dashboards all in a single platform gives a powerful competitive advantage. That’s why SMP partnered with Qlik® to give you the edge. 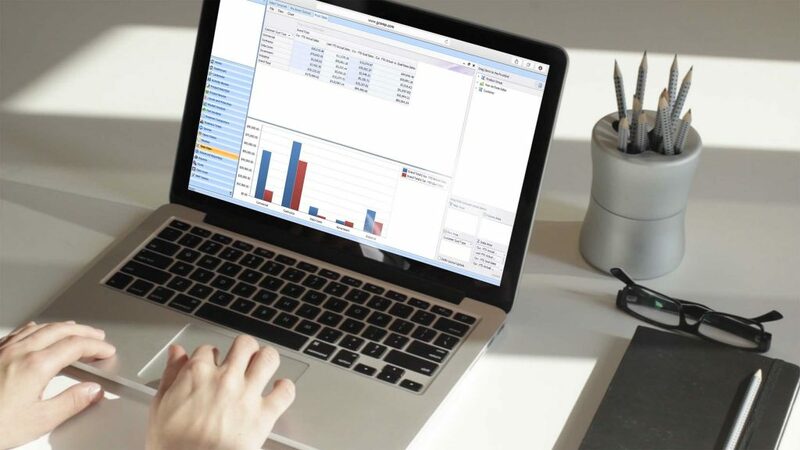 Imagine an analytics tool so intuitive, anyone in your company could easily create personalized reports and dynamic dashboards to explore vast amounts of data and find meaningful insights. 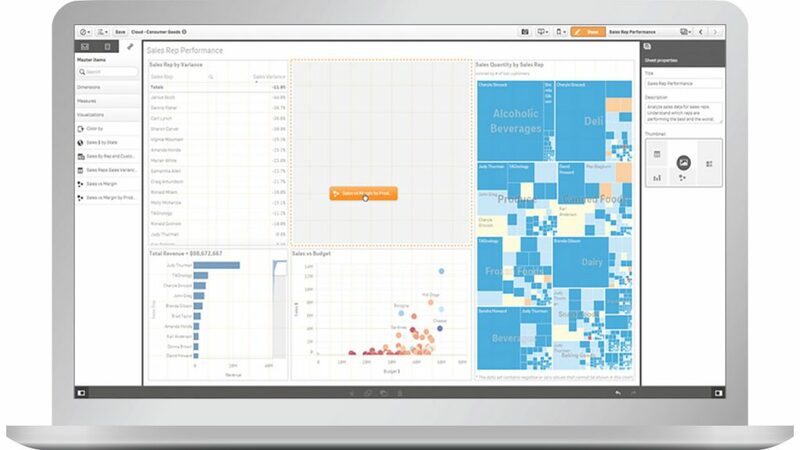 That’s SMP’s new data visualization solution powered by Qlik — a revolutionary self-service data visualization and discovery application designed for individuals, groups and organizations. Self-Service Creation: Drag-and-drop to create your own visualizations — without technical expertise. 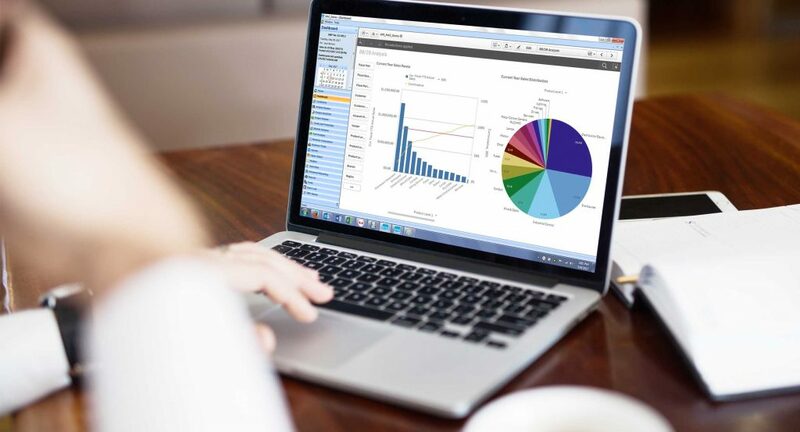 Intuitive: Use simple drag-and-drop interfaces to create flexible, interactive data visualizations. Explore data with smart visualizations that automatically adapts to the parameters you set — no need for developers, data scientists or designers. Smart Search: Use natural search to navigate complex information to accelerate discovery. Allows you to share multiple points of view — with the ability to dive back into source analysis at any point. 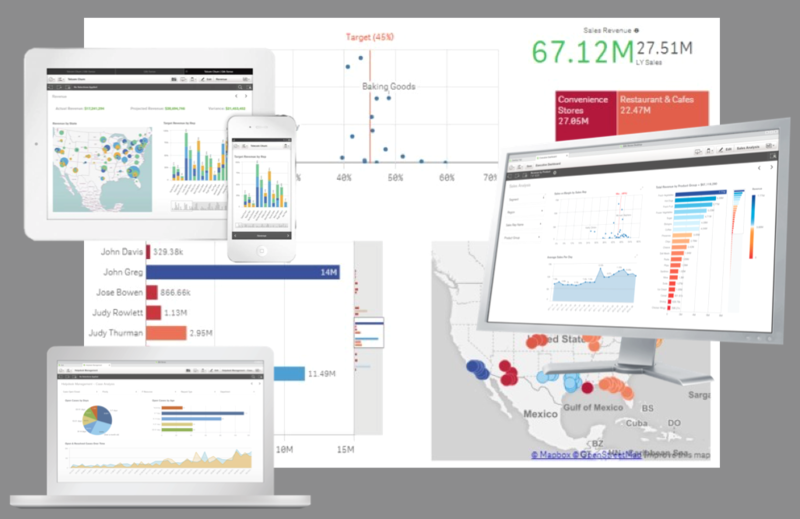 Easily engage, understand, communicate, collaborate and share data to any device with eye-catching, ready-to-use visualizations. Beautiful out-of-the-box visualizations instantly respond to interactions and changes in context. 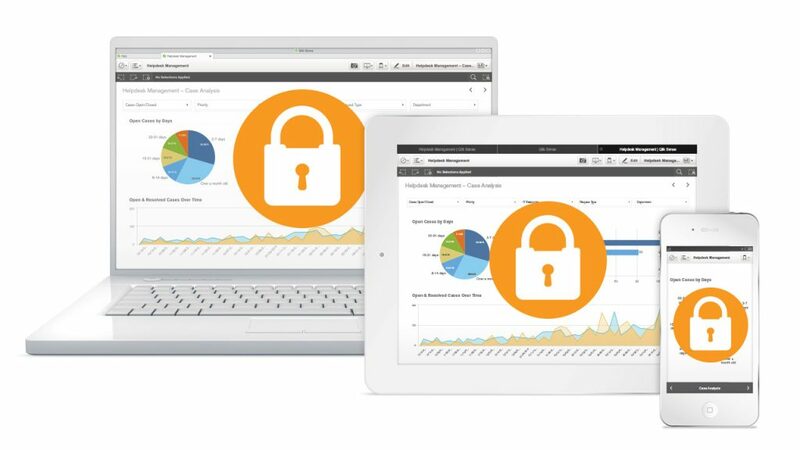 Flexible security for data and content across all devices. Take advantage of data models, apps, dashboards and stories created by teammates. 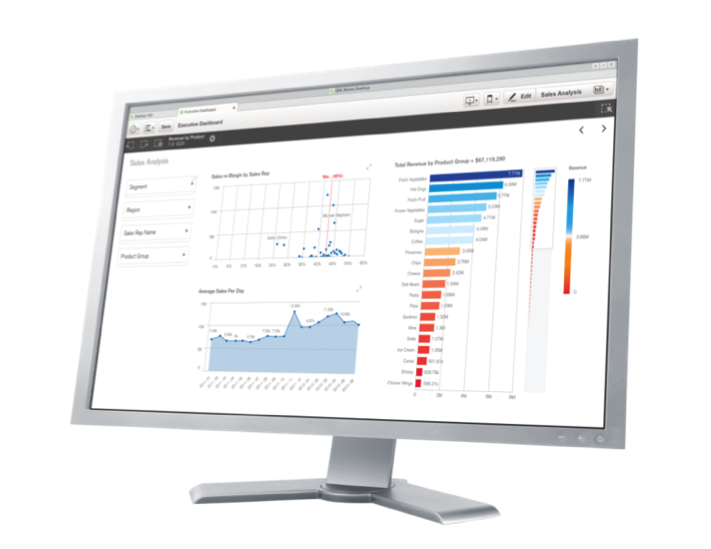 Qlik delivers intuitive platform solutions for self-service data visualization, guided analytics applications, embedded analytics and reporting to approximately 40,000 customers worldwide. 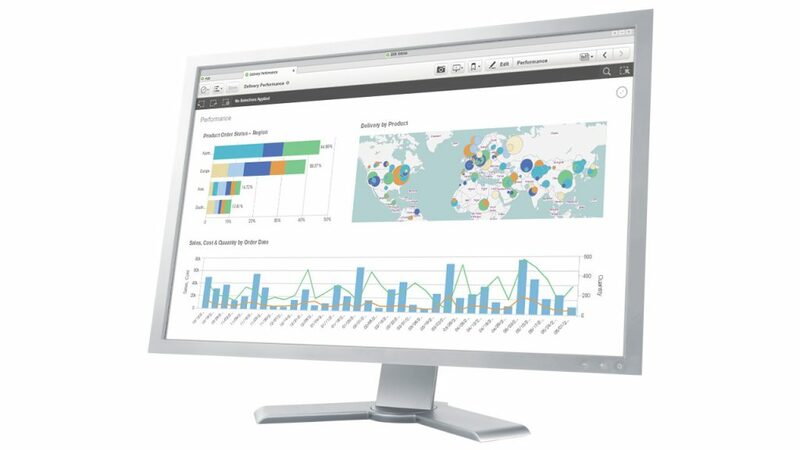 Companies of all sizes, across all industries and geographies, use Qlik solutions to visualize and explore information, generate insight and make better decisions. 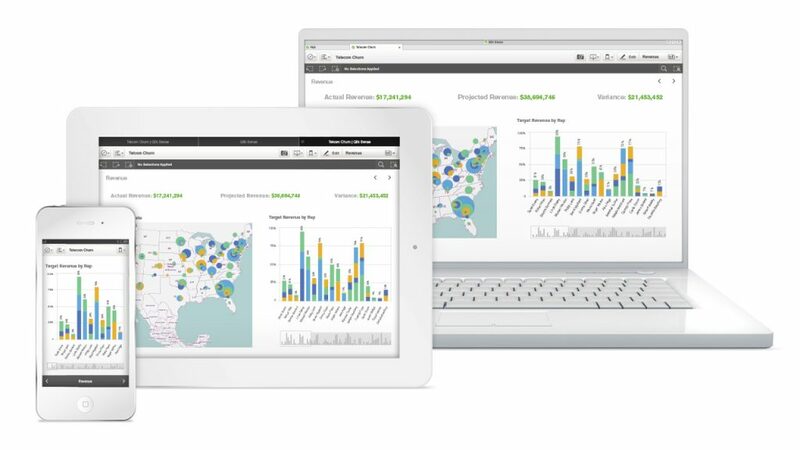 Qlik optimizes Business Intelligence (BI) by harnessing the collective intelligence of people across an organization. Qlik focuses on empowering people—by enabling everyone in an organization to see the whole story that lives within their data. 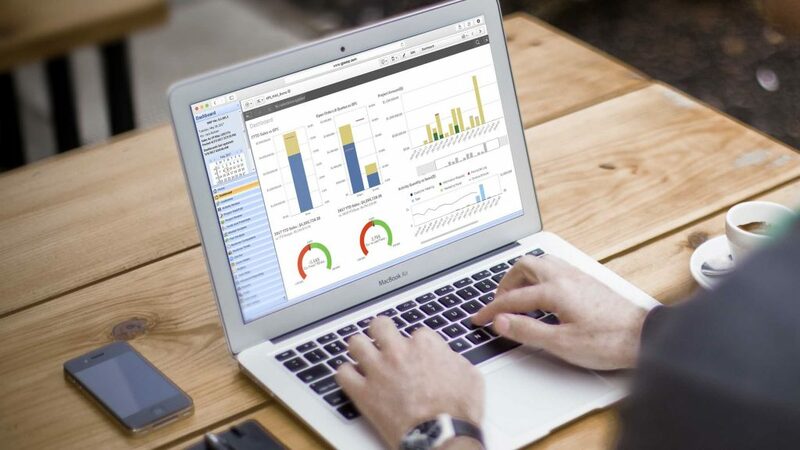 SMP produces actionable business intelligence reports, taking the hassle out of reporting. This powerful business application marries data and information direct from your business system with SMP’s customer data and profiling, allowing your team to execute. You and your teams are able to create reports and charts, preview and edit them, then send to spreadsheet programs or PDF within minutes without troubling your IT team. SMP takes the hassle out of reporting by giving your sales team reports that work the way you work. SMP opens your entire sales process to deeper analysis, allowing you to quickly review the exact information that most influences distribution sales. SMP’s powerful analytics capabilities allow you review and analyze your customers, prospects and vendors. SMP opens your entire sales process to deeper analysis, allowing you to quickly review information about customers, prospects, activities, open orders, sales history, bid and quotes, pipeline, product lines and groups, vendors, along with anything related to your ERP systems such as margins, sales trends, product history and more. You will achieve higher sales results by acting on valuable, easy to access, easy to understand insights. SMP’s is easy and familiar to any Microsoft users with features familiar in MS Excel, like filtering, grouping and sorting. This dramatically minimizes your learning curve and saves time for your IT team. 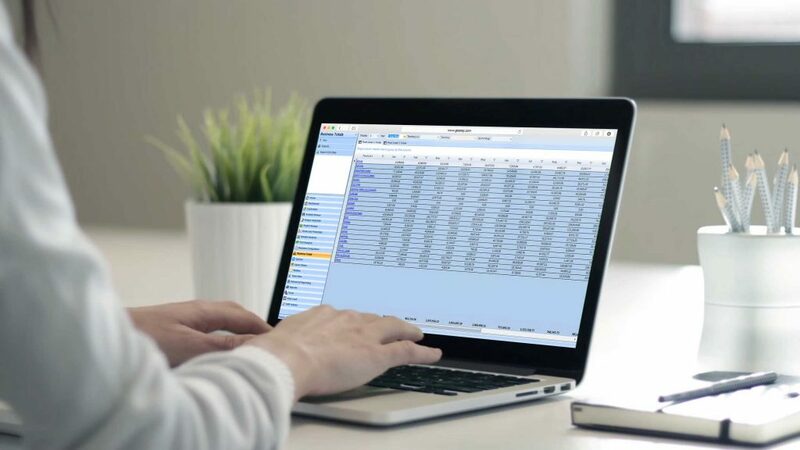 SMP provides the capability to create pivot tables so that you can dynamically group, summarize, arrange and rearrange data in ways that are the most meaningful for your team and situation. This makes extracting and analyzing large, complex sets of data as easy as using a spreadsheet. SMP’s reporting capabilities makes it very easy to create new sales and marketing lists, including all contacts and contact details for every contact belonging to the customers and prospects you want to profile in your campaigns. Being able to quickly and easily create new targeted lists allows your team to make more relevant offers to the exact right set of customers, which in turn increases your sales and marketing effectiveness. You can assign activities for follow up on your customer and marketing lists, use the lists for proactive marketing outreach and then track the results of your coordinated efforts for each list. After completing your analysis, you can automatically assign activities for follow up from any target list. For example, you could create activities for your sales reps to follow up on bids and quotes and make calls to specifically targeted customers based on their purchasing history. 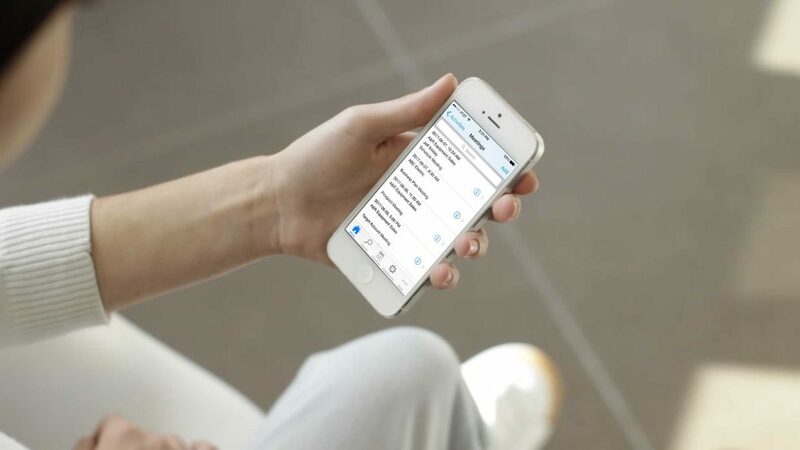 By automatically creating activities, opportunities and follow up tasks for your reps, you will close more of your open orders, bids and quotes, something that every distributor struggles with. SMP’s MarketPro is an integrated, cloud-based email marketing tool designed for distributors. MarketPro allows you to easily create attractive, targeted and effective outbound email newsletters, promotional pieces and custom content to reach your customer base. SMP makes it easy to do scheduled newsletters, leverage your marketing lists, schedule newsletters to go out to one or multiple lists. You can easily create ad-hoc marketing lists based on company and contact information inside of SMP, or create a dynamic list that is automatically updated with new contacts that meet the criteria of that list. Then you simply select your email template or create a new one in our HTML editor, schedule the email and you’re campaign is launched in minutes, not hours. After you launch, access our built-in reports for digital behavior like click-throughs to measure the success of your campaigns and qualify marketing leads. Email marketing with SMP is different from other email marketing services because it features tight integration with a company’s ERP and its advanced list management capabilities. Distributors can leverage the customers, contacts and POS data to do truly targeted marketing. Build dynamic lists right from your ERP inside of SMP. There is no need to have to upload list to a third party; it is automatically available to you for your campaigns, e-blasts, newsletters and more. And with built-in templates and HTML editors, you don’t need a degree in marketing technology to create beautiful emails. SMP makes email marketing even easier with predesigned templates and a built-in HTML editor to design your own templates and email campaigns. Choose from one of our templates and simply add your messaging, branding, logos and more to quickly personalize your emails. Or use our HTML editor to design eye-catching, custom emails for your e-blasts and newsletters. No coding expertise needed. Dynamic and real-time reporting on digital behavior and email click-throughs gives you quick and powerful feedback on each of your campaigns and newsletters. You will be able to see responses and digital behavior when you need it to determine who the best and most qualified leads are from each of your email campaigns. Reporting makes it easy to generate new lists based on digital behavior as well as provide your sales team with the hottest leads from your marketing outreach. Your vendors are too removed from end user data to create and execute highly-targeted campaigns. With SMP, you can quickly create profiled lists for vendor comarketing campaigns, use self-serve data visualizations to demonstrate the effectiveness of those campaigns as well as new market opportunities to justify future comarketing spend. 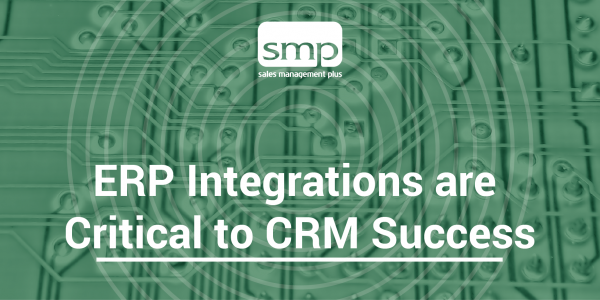 Additionally, by carefully tracking your sales opportunities in SMP, you can pull your vendor reps and support teams into sales calls at just the right moment to close a new deal. One of the most important drivers of your customer relationships is a deep understanding of their preferences and purchasing history. Yet with so many customers to serve, it can be difficult for your reps to remember the many details as they move from one customer meeting to the next. 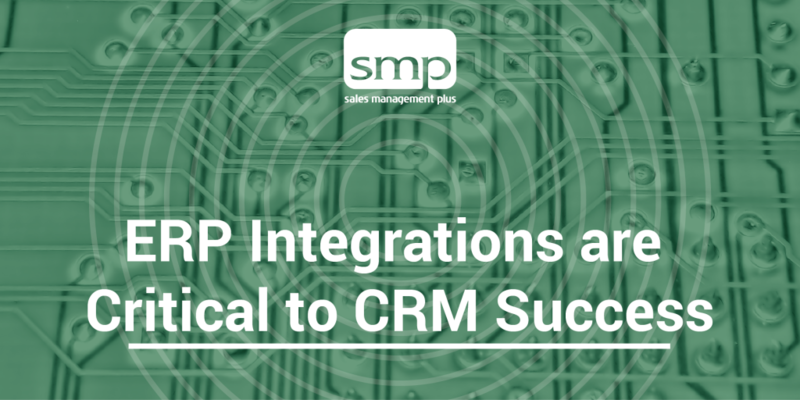 SMP has hooks into your CRM and ERP data so that your reps have access to critical information when and where they need it.  Your reps can access purchasing history, product information, activity history, contact information and more right from their mobile device. Preparing for customer meetings has never been easier. 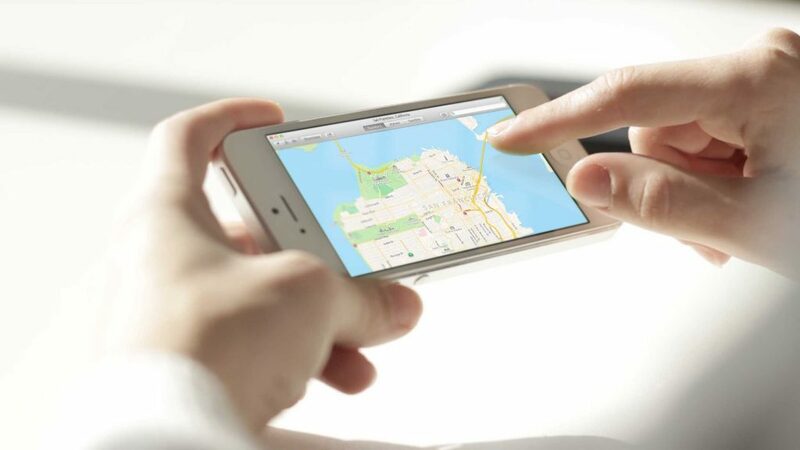 SMP Mobile provides you with activity tracking from anywhere you have access to your mobile device. Your reps can keep track of their day, add tasks, log phone calls, record customer meetings and log information requests while they are visiting customers. Everything they do on their device syncs back to the desktop version of SMP. That means you have real-time access to data and know exactly where they are, what they’re working on and you have the ability to report on the data at any time. 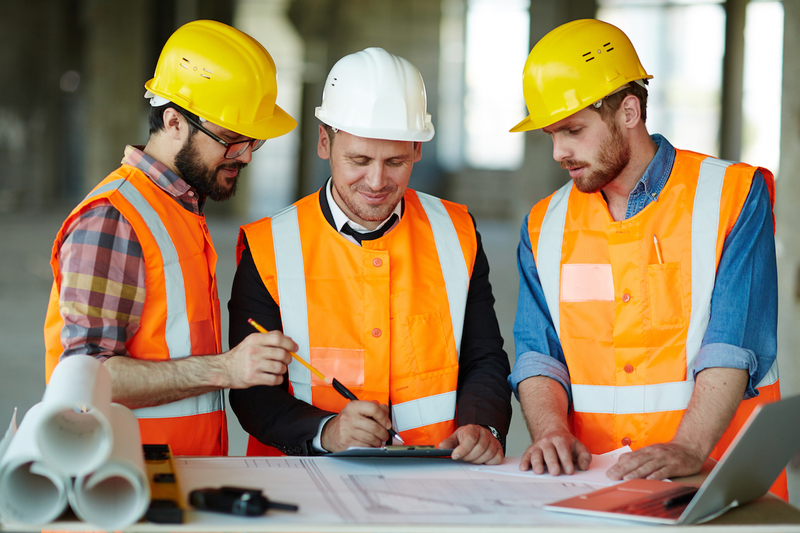 Sales reps can review projects the customer is associated with as well as the projects for which the customer is the primary account while they are in the field working with the customer. Reps can add projects and assign tasks and activities within a project to themselves, a customer, an associate, a partner or a vendor. SMP Mobile lets you access all of your important contacts — customers, prospects, vendors and more — in the field where you need that information the most. 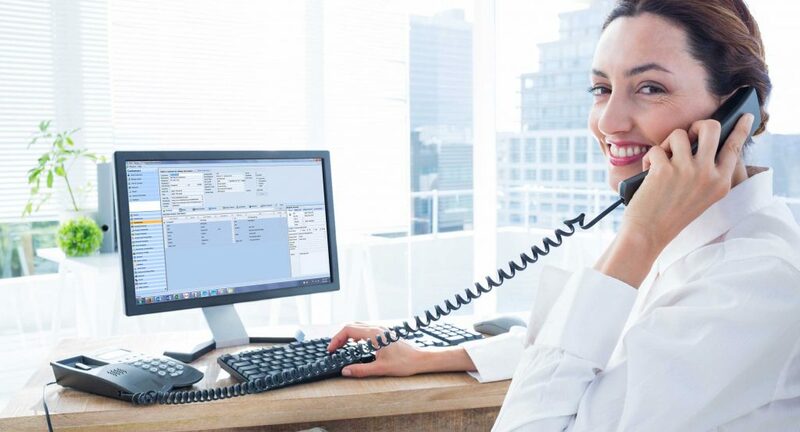 Access and maintain contact information like email, cell phone, address and driving directions or view and update activities, notes, sales information and more. 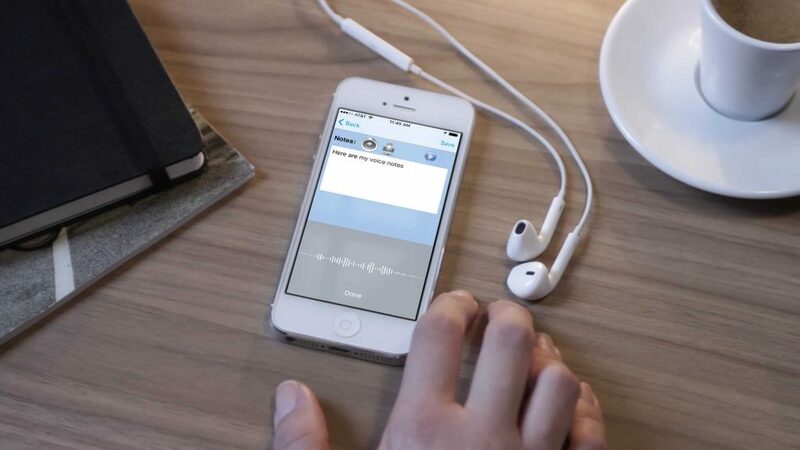 With SMP Mobile, you can use your phone’s built-in voice recognition software to “talk” your customer meeting notes, task updates, or phone call notes directly into an SMP activity. This is a huge time saver as your reps move from meeting to meeting and it helps them keep their customer information as up to date as possible. One of the many benefits of offering SMP Mobile as a native mobile app is taking advantage of built-in device functionality such as click-to-call. With one click, your reps can call their customers from anywhere in a matter of seconds. Your running late to an important customer meeting and you realized you don’t remember if they’re on the south or north end of Commerce Street. With SMP, you can quickly access the customer’s contact information and receive turn-by-turn navigation instructions to their offices. 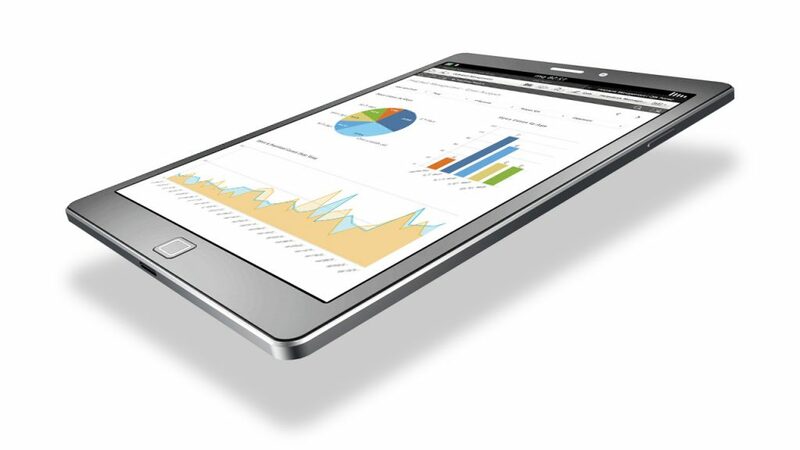 Having access to SMP’s powerful dashboards and BI from your mobile device allows you to share important information and analysis with your customers during meetings using self-serve data visualizations that are easy to understand and visually appealing. Our tight integrations to the leading distribution ERP systems give your reps something they may have never had before — real-time access to the data inside of your ERP system.  That means they can access product information, sales history and more and know that it is up-to-date. 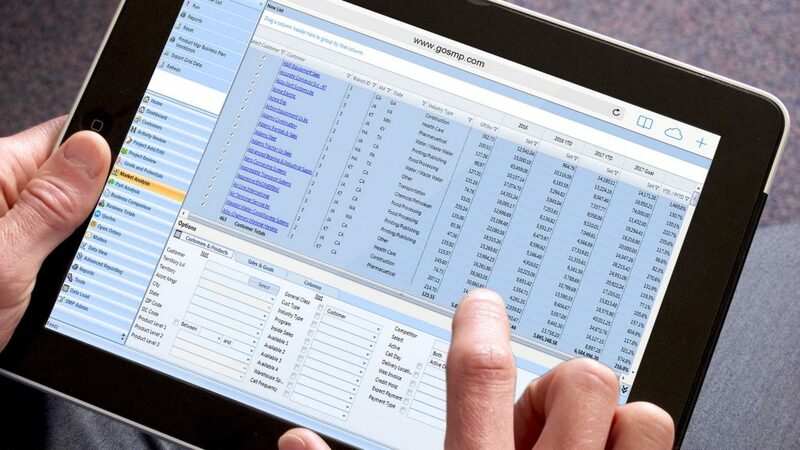 SMP maintains powerful integrations to your distribution ERP software that allow you to better understand the relationships between your customer and sales behavior and connect it to important operational information about customers, geographies, product lines, part-level data and more. The team at SMP has deep experience in distribution technology and understands the requirements of integration to all of the leading distribution ERP systems, including Epicor Eclipse, Epicor Prophet 21, Infor SX.e, Mincron and many others. Read what industry experts and analysts are saying about SMP’s award-winning BI powered by Qlik and SMP’s leading distribution CRM.